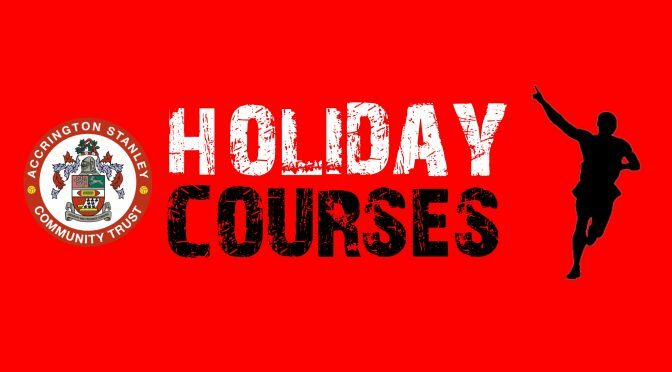 Our Holiday Courses provide school holiday provision for hundreds of children every year and offer young players the opportunity to learn, develop and achieve in the holidays. Our Soccer Schools program has grown to cater for children across the county, with each venue being carefully selected to provide adequate play and changing facilities regardless of adverse weather conditions, allowing youngsters to develop safe in their surroundings. Aimed at children aged four to 12 years old, Soccer Schools work in age-banded groups of no more than three years apart. This allows children to safely participate and the coach to accurately challenge and assess the needs of the player, under full supervision. Our development team has carefully put together course itineraries that cover a wide range of football related topics including, control, passing, dribbling, shooting, heading and match play. Our coaches use a variety of activities to allow children to develop, coaching individually or in pairs to develop technique and working in small groups to encourage skill acquisition and decision making. Every day, children will have the chance to practice in small-sided games and every course will finish with a tournament for players to showcase their new skills. Soccer Schools remain an affordable holiday activity; that provide the perfect solution for all young footballers and their parents. Our Activity Club provides school holiday provision for lots of children every year and offer the children fun and structured activities during the holidays. Established in 2012, our Activity Club programme has grown to cater for children across the borough, with each venue being carefully selected to provide adequate play and changing facilities regardless of adverse weather conditions, allowing youngsters to develop safe in their surroundings. Aimed at children aged four to 12 years old they allow children to safely participate in a wide range of activities from Performing Arts and Dance to Multi-Sports with lots in between! Our Activity Club development team has carefully put together course itineraries that cover a wide range of different topics including, Arts and Crafts, Dance, Acting, Singing, Cinema Club, Multi-Sports, Games and much more. These allow children to develop, working individually or in pairs to develop and working in small groups to encourage skill acquisition and decision making. Every day, we have a different theme for example on a Friday we have a ‘Stanley Stars Talent Show’. The Activity Club is an affordable holiday activity; that provides the perfect solution for all young children and their parents. Elite, advanced and innovative football coaching during school holidays for children aged 4 to 12. The Accrington Stanley Elite Coaching Soccer Schools are open to children who would like advanced training from Academy standard coaches to develop them as individuals. Our Elite Coaching Soccer Schools take place on state of the art 3G AstroTurf and all sessions are led by Accrington Stanley coaches working on behalf of the Community Trust with minimum UEFA ‘B’ coaching qualifications who work to a specifically designed technical program which is age related with the main emphasis on development and ball mastery. The coaching is structured around the FC Barcelona philosophy of Tiki-Taka football and every day will consist of technical and high tempo football sessions. The number of places on the courses will be restricted to ensure the coach to player ratio is always kept at an optimal level. The children who will attend the course will be a mixture of the Accrington Stanley Football Club Academy players and local grass roots players who will all be keen to come and develop as footballers over the course of the programme. All courses run from 9am to 3pm or 9am-5pm every day and are held at Accrington Academy, Queens Road West, Accrington, BB5 4BA. Compliment the player’s current football provision. Children who would like to play football purely for fun are asked to book and attend the Soccer School which will be running at the same time. Please see below for an example plan of the Elite Soccer School week.